There can be no democracy without a well-informed citizenry. NOTE: Many thanks to Cenk Uyger and Bill Moyers, among others, for inspiration and information used in creating this presentation. That's the mature, practical view of the world." • fictional example: BROADCAST NEWS – experienced and passionate reporter Albert Brooks vs smooth-and-bland newcomer William Hurt. One is a real journalist, the other a pretty face who reads a prompter. The William Hurt character does not see himself as a corporate stooge, nor did he sacrifice any values to attain the position. No, he was CHOSEN for that position by the corporate owners BECAUSE he already was the bland, obedient personality they were looking for. Real Life Example: Ditto too many corporate-owned politicians today. They did not have to sacrifice integrity to become stooges for their corporate donors. No, they were CHOSEN by those corporate donors to run for office BECAUSE they were already willing to sell out The People for the sake of their own personal gain. •The system self-filters because wealthy Corporate donors pick the winners (and prior to 2016 the candidate with the most money won 98% of the time). •“Winners” are picked because they are willing to serve Corporations. 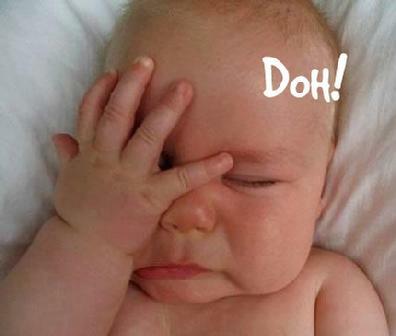 “Liberal” MSNBC fired both Phil Donohue and Pat Buchanan because they voiced opposition to Iraq War. Jesse Ventura signed contract for millions of dollars, but when MSNBC learned he was against Iraq War, they refused to put him on air. Would not let him out of his contract. They paid him the millions – to keep his voice silent. Ashleigh Banfield – rising star on MSNBC until she gave a fiery speech against the war on a college campus. Immediately pulled from the air – but again, they would not let her out of her contract, so she was unable to speak on air, anywhere. Ed Schultz - lost his prime time show after he criticised TPP. Bow your head, toe the line. We used to have a free press. Walter Cronkite spoke against the Vietnam War… without repercussions. Back then, the political establishment was afraid of him and his influence as an experienced and respected figure. They took on the biggest guns in the Establishment – and they WON. • From 1969 to 1972, the entire American Big Business community experienced a series of political setbacks without parallel in the postwar period. • Washington undertook a vast expansion of its regulatory power, introducing tough and extensive restrictions and requirements on business in areas from the environment to occupational safety to consumer protection. The Rights of Citizens were ascendant. The right to live free from being deliberately polluted or endangered by reckless, profit-hungry corporations. •In corporate circles, this pronounced and sustained shift was met with disbelief... and then, alarm. What happened between 1970 and today…? •The organizational counterattack of Big Business in the 1970s was swift and sweeping — a domestic version of Shock and Awe. •The number of corporations with public affairs offices in Washington grew from 100 in 1968 to over 500 in 1978. •In 1971, only 175 firms had registered lobbyists in Washington, but by 1982, nearly 2,500 did. om under 300 in 1976 to over 1,200 by the middle of 1980. What the numbers alone cannot show is something of even greater significance: Corporations learned to work together to achieve shared political goals. What Made Such Dramatic Change Possible? That he appointed Powell to the Supreme Court in 1972. FYI, Powell was among the 7-2 majority who legalized abortion (Roe v. Wade) - goes to show how much the Repubican Party has changed in 40 years. Legal case in which the U.S. Supreme Court on January 30, 1976, struck down provisions of the 1971 Federal Election Campaign Act (FECA)—as amended in 1974—that had imposed limits on various types of expenditures by or on behalf of candidates for federal office. democracy began dying in the 1970’s. So... Thanks to two Supreme Court decisions in the 1970's, legalized bribery became the new standard operating procedure in Washington DC. 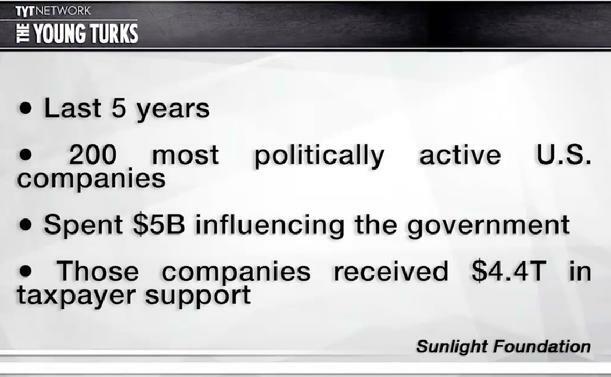 What effect did the flood of corporate money have? Spend 5 billion... Get 4.4 Trillion back. Then in the 1970's the Supreme Court ruled that corporations could direct-pay politicians, and thus opened the floodgates for legalized bribery in Washington. Payroll Tax now accounts for 37% of total taxes paid. as payroll taxes went up, workers' wages STOPPED going up (failing to even keep up with inflation). 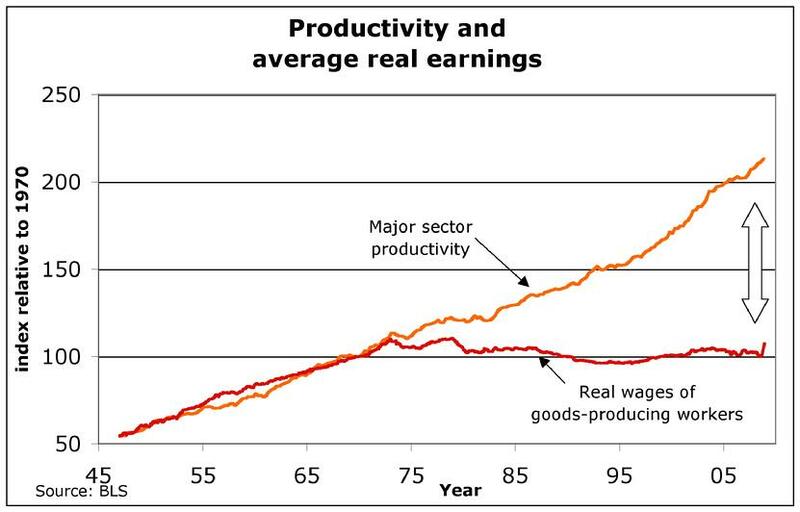 Wages had been going up and up steadily since WW2... until mid-70's, then wages flat-lined. Meanwhile profits from worker productivity continued to climb, to record heights today. and 12 Trillion MORE profit to the corporations. Corporations are an invention. 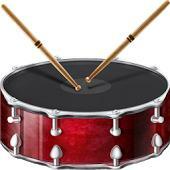 Humans invented them. Corporations are just like Robots. Humans invented them, and humans wrote the code that programs them. Remember Isaac Asimov's warning about Robots? They need to be programmed not to cause harm to humans. We need to reprogram the robot! How to rewrite the code...? 1)Reclaim the media, so people have access to the truth. Right now, corporate-owned media is the mouthpiece for the Corporate Oligarchy/Establishment – the ones who select/promote only those media personalities who do not challenge the status quo. If you watch the corporate media, you have been conditioned to believe that it is unrealistic -- impossible! -- to get money out of politics. As if "its always been this way." NO! It has not always been this way. SCOTUS-created Legalized Bribery only dates back to the 1970’s. That’s only halfway through one human lifetime. A problem that is no older than half a human lifetime...? In fact, #1 is already happening. There are digital media outlets that tell the truth. Among them is the largest online news service in the world. It has NO corporate owners or sponsors. 70% of its audience are 18-35 years old. over half of them get their news from this outlet. This news outlet is changing the world. Media presence is the shadow cast by the generation in the majority. There is a reason Fox and MSNBC are becoming sidelined, while objective and independent media… is becoming the front line. Millennials can fact check faster than politicians can lie, which is why Bernie created a revolution, times they are a changing. TYT (The Young Turks) is the largest online news service in the world. On November 8, over 4.5 million viewers tuned into TYT’s live stream to watch the election results. TYT started as a one-man show 15 years ago (from his living room), and today it employs 60-70 or more staff and has several teams of investigative reporters and camera operators covering stories around the country. TYT has NO corporate owners or sponsors. It owes its allegiance to its audience MEMBERS who support the network with monthly subscriptions and generous donations. TYT has an international audience and Members all over the world. Mostly... young. "Terrifyingly liberal." Among this age demographic, "socialism" polls positively, while "capitalism" does not. TYT and its young audience are the future of democracy in America. But TYT is more than just a news organization. It is expanding into advocacy and political action. Some years ago, TYT founder Cenk Uyger (and others, like Move to Amend) determined that we need a Constitutional Amendment to get money out of politics. Amend the Constitution to make it clear that only human beings are people, and money is not speech. 90% of all Americans agree. Americans of all parties agree. "Get Money Out of Politics" is a non-partisan ideal, embraced by nearly everyone (outside of Washington DC). At this moment, the internet is awash in false narratives about the so-called "dangers" of a Constitutional Convention (Con-Con). Whatever your poitical affiliation -- left, right, center, far-right, far-left, everything inbetween -- there is a narrative that has been written for the express purpose of pushing your psychological buttons. "BEWARE the Constitutional Convention...! If we have one, the entire Constitution will be re-written to... (insert whatever you fear most)." And by the way... as both Cenk and the New Mexico guy point out, odds are that there will never be a Constitutional Convention, because before that can happen... Congress will scramble to pass the Constitutional Amendment itself (getting ahead of the ball). How often does that happen...? Often. HALF OF ALL AMENDMENTS to the Constitution began as a threat by the States to hold a Constitutional Convention... and only then did Congress act on its own, to pass the Amendment by floor vote. HALF. 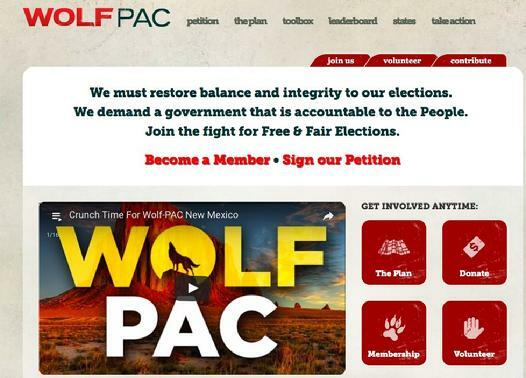 Their mission: Pursuade legislatures in 34 states to pass Wolf-PAC resolution to get money out of politics. 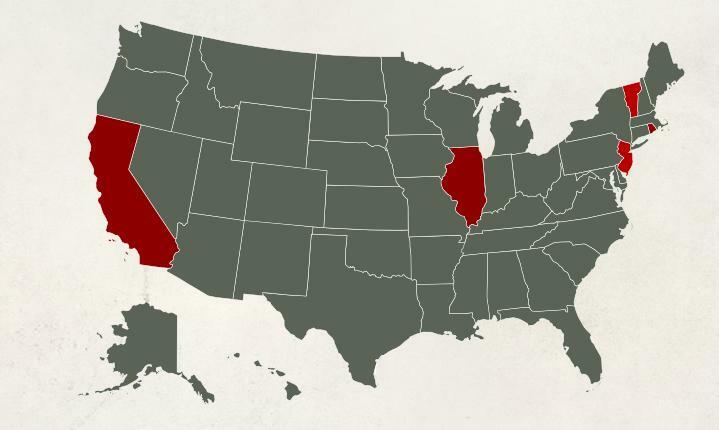 There is no time limit for how long it can take for 34 states to pass the resolution. However, for any state to pass it, both houses (Senate and Assembly) must pass the resolution within the same year. When Rhode Island voted, the gallery (packed with Wolf-PAC members) was forewarned not to make noise or be disruptive during the debate and voting. The vote in favor of the Wolf-PAC resolution was UNANIMOUS. gave the Wolf-PAC volunteers a standing ovation. In Missouri, it did not pass the Senate in time for the whole state to pass, but in the House, 86 Republicans voted with Democrats in favor of getting money out of politics and it did pass the House. Wolf-PAC will try again next session. Similar situation in Texas -- many Republicans voted with Democrats to oppose money in politics. Not a total victory yet, will try again next session. A fascinating thing just happened in Connecticut, where the Wolf-PAC resolution did not pass. Wolf-PAC remembers the names of those who vote in favor of corruption. One particular Republican who voted AGAINST getting money out of politics wound up running for a vacated seat in a special election this spring. This was a seat that had been held by Republicans for over a century. The last election held for this seat was 4 months ago, and at that time, the Republican beat his Democratic challenger by 36 points. This is the kind of "hopeless" seat which the Democratic Party refuses to even contest, and certainly won't invest money or resources. But the fact that the Republican running in the special election had voted against Wolf-PAC got Cenk's blood up. Time to try something new. 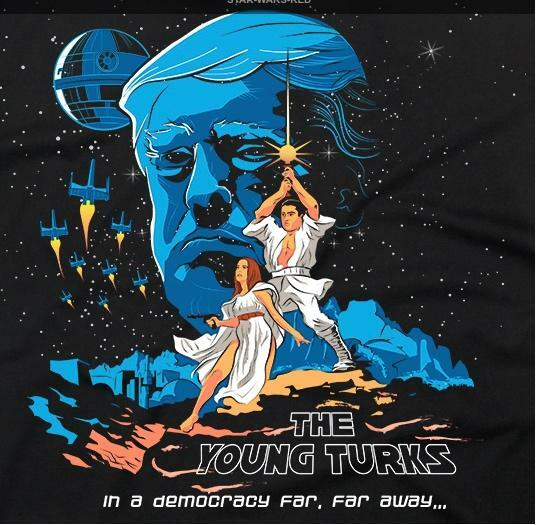 With just two weeks' notice, he deployed the "TYT Army" to Connecticut, where 500 volunteers hit the streets and began knocking on doors... "Did you know that (the Republican) voted in favor of corruption? Did you know that he opposes getting money out of politics?" Remember, 90% of all Americans from all political parties are opposed to the corrupting influence of Money in Politics. When the final votes were counted, the Republican still won... but only by 10 points. From 36 points just four months ago, to 10 points two weeks ago. That is a 26-point swing...! And remember, Wolf-PAC only had two weeks to work the vote. 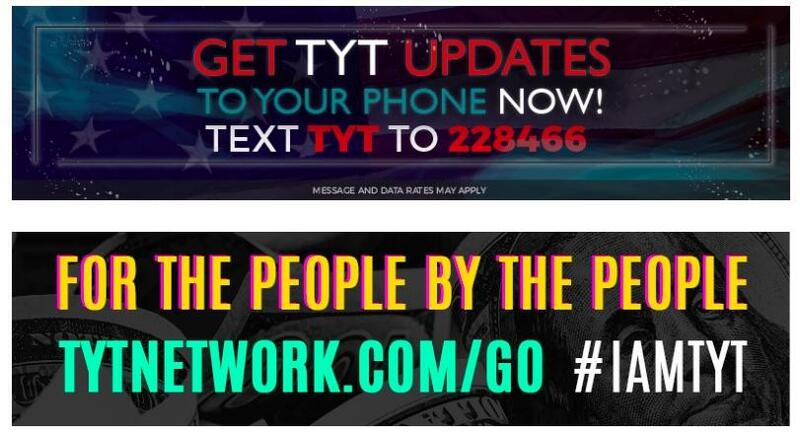 How to find and watch TYT news broadcasts for free on You Tube: instructions in PDF. Try it for just one week. If you have been in the habit of watching ABC, CBS, NBC, CNN or MSNBC... TYT will blow your mind, and change your view of the world. Hold onto your socks -- you may find yourself becoming "terrifyingly liberal."